By now, you likely have heard of Radon…an odorless colorless gas that causes cancer. But, exactly what is it, and more importantly, how can we get rid of it? Radon is a gas that is caused by the natural breakdown of uranium in the soil. It appears to be located in areas of high granite content most often. As it happens Iowa is one of the higher reading locations, due to the glacial activities that exposed the Canadian Shield bedrock formation and tumbled the rock down to the plains of the Mid West US. Radon can also be found in higher readings across Ohio and Pennsylvania, glacial activity is likely the cause here as well, due to the proximity to the Canadian Shield, but the rich mining veins also contain Radium and Uranium which is released when the ore that contains them is broken down to smaller size. Radon is measured in Pico-Curies per liter of air, similar to the more popular PPM (parts per million). Guidelines state that nothing need be done if the level is under 4 pico curies, but it certainly couldn’t hurt to mitigate even that little amount. The ill effects of Radon are caused not by the gas itself, but the by products of its decay. These particles are small enough to be inhaled and lodge themselves in the body and continue to decay, all the while releasing radioactive isotopes that can harm the vital cell structures of the lungs. While cancer is certainly the one we all hear about, the breakdown of cellular tissue is likely causing other health problems. Sealing – If you have a crawlspace you can cover the earth floor with a non permeable vapor barrier, this could be considered enough in certain areas or depending on your Radon level. If this is not possible, or if you have a Basement, begin by sealing the cracks and joints, and even where utilities and other services enter the home. Sub Slab Depressurization – This consists of having an active fan pulling air from under the slab (or vapor barrier) through a piping system and releasing it into the atmosphere. This is probably the most common way Radon is eliminated, and really the only way to go if you have elevated readings. Typically, there is a hole drilled through the slab down into the gravel bed; a connection made to the perimeter drainage system; or a perforated pipe in laid under the vapor barrier. This is then connected to a fan mounted to some PVC pipe, which is run up above the eaves of the roof to discharge the effluent air. A less common way of battling Radon if the alternate methods aren’t achievable is to run positive pressure in the house. This is as simple as it sounds, there is a fan pulling air in from outside which creates an envelope of air pressure that keeps the Radon from flowing in.This Is Not the preferred way of doing this, and in todays tightly built homes, probably not a good idea in any case. It is far preferable to remove the Radon from the general area than to swat it away as it were. Fan sizes – There are many fans you cam purchase for Radon Mitigation, which one you need can only be determined correctly on site. If we have enough cohesive information a recommendation can be made, but you will need to have some specifics regarding your property. The whole idea of sub slab depressurization is not to purchase the highest CFM you can (like you would for a kitchen) but enough to lower the pressure under the slab to allow the Radon to be evacuated. In fact, too much can be a bad thing, with too much fan you run the risk of actually elevating your Radon level by bringing more to you. Domestic water supply to our homes tops out at around 60 PSI. So, that’s a lot, right? What we forget is that the more automated our lives have become, the more auxiliary devices we have to take care of us. Such as sprinkler systems, dishwashers, clothes washers, well you get the idea… The downside to that is the water pressure can only do so much before things start to not be what they should. There are few things worse than having to take a shower in water that barely comes out of the showerhead. The best way to maintain pressure to the house is with a Davey BT Pressure Boosting Pump. What these pumps do is sense the amount of water being drawn into the house and begin pressurizing the water supply to keep all those fixtures pouring as they should. They can provide a set amount of water at a set pressure increase indefinitely, so that new Rain Forest showerhead or whatever they are calling it today will in fact provide enough rain to cause you to believe you are on an Amazon trek. Davey pumps are installed near the water supply line to the house, so are out of the way…and better yet, they operate all on their own. Once installed, the Torrium module operates the pump as necessary to keep the pressure even. 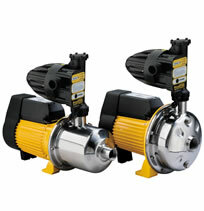 There is no maintenance, adjustments or otherwise to this pump, you install it and let it work for you. Caveat – Please consult us to get the right one for you, you cannot get the most powerful one simply because of the impressive performance numbers, it must be sized properly to the system it is going on. We are more than happy to discuss this with you. We always would like to spend the time necessary than sell you something inappropriate.